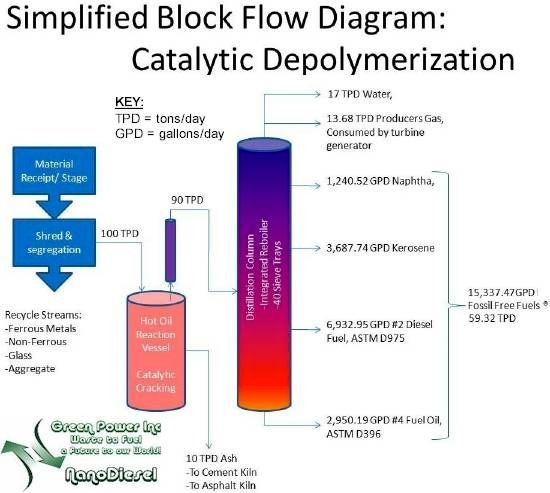 Thermal depolymerization (TDP) is a depolymerization process using hydrous pyrolysis for the reduction of complex organic materials (usually waste products of various sorts, often biomass and plastic) into light crude oil. It mimics the natural geological processes thought to be involved in the production of fossil fuels. Under pressure and heat, long chain polymers of hydrogen, oxygen, and carbon decompose into short-chain petroleum hydrocarbons with a maximum length of around 18 carbons. Brad Lemley (May 2003). Anything Into Oil Discover. Brad Lemley (July 2004). Anything Into Oil (Update) Discover. Brad Lemley (April 2006). Anything Into Oil (Update) Discover. Peter Fairley (November 2008). Go Green This Thanksgiving: Turn Turkey Guts Into Oil. (Update) Discover. Yuanhui Zhang, Ph.D., P.E. (PI), Gerald Riskowski, Ph.D., P.E., Ted Funk, Ph.D., P.E. (1999). Thermochemical Conversion of Swine Manure to Produce Fuel and Reduce Waste. University of Illinois. Stefan Lovgren (July 2, 2004) Pig Manure Converted to Crude Oil National Geographic News write up about the above paper. Andrew Kantor (January 22, 2004). CyberSpeak: Killing germs, reducing waste, making oil. USA Today. Theo Asir (December 1, 2003). Depolymerization Field Observation Report (observation of Carthage, Missouri plant). Mark Kawar (May 9, 2003). "From trash to black gold". Omaha World Herald. Res-Energy (Accessed 2004). RES Plant Daily Output (PDF, 32.5kb). Renewable Environmental Solutions. Fortune Magazine Article (February 2005) update on the Changing World Technologies plant.